The Tasting Room at Stone’s Throw Winery. Photo by Dan Eggert. What is it about the imaginary line that circles the globe half way between the equator and the North Pole? All the way around the northern hemisphere, the line that demarcates the 45th parallel holds the viticulture secret to the growing, harvesting and crushing of grapes to make wine. From the Bordeaux fields of France to the Willamette Valley of Oregon, the middle of the top half of the globe seems to be where the grapes grow best and the wine prospers. For those of you who did not know, Door County also lies right in the path of the 45th parallel, halfway up the globe. And for a peninsula only eleven miles wide, the county has enough wineries to claim its place on the all-important wine circle. Why make a trip to California when you can tour the wineries of Door County and spend a relaxing afternoon tasting the fruits of the wine maker’s labors? Founded in 1974, Door Peninsula Winery in Carlsville is the oldest of the three major wine producers in the northern part of Door County. The winery is located at the intersection of highways 42 and I, in the former Carlsville schoolhouse. The one-room school was built in 1868 and served the area’s educational needs until 1963. In 1974, the schoolhouse was renovated and the Door Peninsula Winery was born. Additional remodeling was completed in 1996, which doubled the size of the tasting room and created additional space for a gift shop as well. From Apple to Zinfandel, there is a great deal to chose from at Door Peninsula Winery; they feature more than 30 natural fruit and grape varietal wines. The local cherries, raspberries, apples and other fruits Door County is known for create their award-winning fruit wines. The winery consumes nine million pounds of cherries annually, along with 4.5 million pounds of apples, to produce over 70,000 gallons of wine each year. 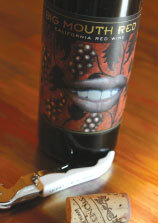 The fruit wines produced by Door Peninsula Winery are very well regarded. In 2002 alone, the winery received awards in six competitions, including three awards for their Strawberry Zinfandel from the Riverside International, Amenti Del Vino and San Francisco Wine Competitions. The folks in Carlsville are very serious about winemaking, but aren’t afraid to let their humorous side show. They wink at traditional wine styles with their Cranbernet and Chardapple flavors, and they produce special spiced holiday wines for Halloween and Christmas. When you stop by the Carlsville schoolhouse for a taste, make sure you take the guided tour and meet Charlie Cherrywood, the animatronic host of the audio-visual portion of the journey. In addition to their famous fruit wines, Door Peninsula Winery is moving into the world of the traditional grape varietals as well. They are already producing Zinfandel, Chardonnay, Merlot and other grape types, including a reserve Port. They currently have 3000 vines planted on seven acres, with plans for an additional five acres in the near future. As those vines mature in the next four to five years, look for interesting new wines from the folks in Carlsville. Stone’s Throw Winery is the premier producer of fine wines in Door County. Available at most fine dining restaurants in the area, as well as in retail stores and their own tasting room, Stone’s Throw has been producing Door County wines from grapes grown here and in California since 1998. The winery is located at the exact center of Door County at the intersection of county highways A and E.
Winemaker Russell Turco and his partner Karen Duffy currently have almost thirty wines available in the tasting room. From their popular Field Blend table wines to Reserve Chardonnays and intense Cabernet Sauvignons, Stone’s Throw has a wine for any palate. Visitors can receive an education on wine making and enjoying from Turco as he proudly pours his wares for guests. “Every wine that I produce, I enjoy drinking,” he says. Turco, a retired Chicago businessman, continues: “It is our belief that with great grapes, small tank fermentation, judicious use of oak barrels, attention to detail and minimal handling, fine wine makes itself!” Although Stone’s Throw maintains a small vineyard at their winery, the majority of their grapes are currently grown in California. The winery owns or controls 70 acres of vineyards in the major wine producing areas of Napa, Sonoma and Santa Clara Valleys. Each harvest, the grapes are picked in California and driven cross-country in refrigerated trucks. They arrive in Door County about 35 hours after they’ve been picked. Within hours of their arrival at Stone’s Throw, the juice from those California grapes is already fermenting and on its way to becoming Door County wine. The winery and grounds, created out of an historic 80 year-old barn and farm, features picnic tables and a bocce ball court, for those who want to pass their time slowly. Turco likes to start a full tasting of Stone’s Throw wines with a sampling of his Vintage California sparkling wine. He’ll then happily pour a taste of light and refreshing Riesling, their biggest seller. However, it is their Pinot Noir and Zinfandel wines that have brought the most recognition to Stone’s Throw. There are two Pinot Noirs and five Zinfandels currently available for tasting. Stone’s Throw “Library Wines,” older vintages now available only in limited supplies, include Pinot Noir and Zinfandels from 1996, just beginning to reach their full potential. The tasting room at Simon Creek. 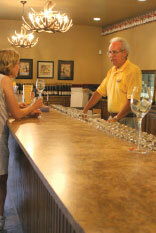 The newest winery in the county opened for business on June 26, 2003. Simon Creek Winery, about three miles west of Jacksonport, is a brand new, state of the art wine producing facility. The 11,000 square foot winery has the capacity to produce over 15,000 cases of wines each year, instantly making it one of the largest wineries in Wisconsin. Simon Creek, with its wine colored metal roof, is situated next to a 125-year old barn on a knoll overlooking Simon Creek and Pond. Wine tasting is offered in a beautiful room with high vaulted ceilings, with large windows behind the bar giving visitors a view into the wine storage and production area. Guests are able to relax on the large wooden deck overlooking the vineyards or on overstuffed couches in front of a roaring fireplace while enjoying a glass of wine, accompanied by cheese and sausage purchased at the small farm market within the winery. 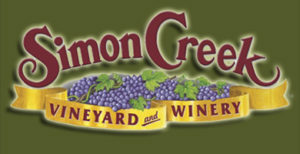 Simon Creek is initially offering eight wines to the public: three reds, three whites, and two specialty wines. They include Merlot, Cabernet Franc, Ruby Cabernet, Gewürztraminer, Chardonnay, Port Jackson Port – clever, huh? ), Golden Muscat, and Cherry wines. The Ruby Cabernet is also known as Untouchable Red. The story goes that back in the days of Prohibition, a Door County tourist from Chicago made an offer to farmer Simon to sell the family farm. The pushy Chicagoan, with a prominent “scar” on his “face” and the first name of AI, was unsuccessful in his attempt. The Simon farm remained untouched. Simon Creek currently has 30 acres planted with new vines, making their vineyards the largest in Wisconsin and amongst the largest in the entire Midwest. Simon Creek is growing twenty varieties of vinifera and hybrid grapes. At maturity, in three to four years, they expect the vines will produce 200 to 250 tons of grapes -enough to make 50,000 gallons of wine. As their vineyards mature, they plan to add an additional 15 varieties to their bill of fare. Simon Creek Vineyards. Photo by Dan Eggert. Simon Creek founder Tim Lawrie is a retired Army officer and energy development executive. Sharp-eyed visitors might recognize Tim from his role as a military consultant for NBC and MSNBC, appearing on numerous network and local news shows. Winemaker Tom Payette was selected as “Winemaker of the Year” in 1999 by Vineyard and Winery Management Magazine. “With our work in grape production, we hope to create a new agricultural industry in Door County,” said Simon Creek General Manager Lance Nelson. With a growing number of wineries in the county, each planting acre upon acre of vines, it seems as though grape growing might someday challenge cherries as the county’s premium produce. If only we could do something about those pesky long winter months. As the days grow shorter in the fall and summer houseguests and visitors have evacuated your extra bedroom, an autumn weekend afternoon is the perfect time to visit the wineries of Door County. Learn all about the production of wine from the makers themselves. Watch automated machines from Italy that can fill, cork, label and cap a bottle of wine every two seconds. Finally, taste the many different wines that are produced in Door County. Savor the wide variety of flavors available. Take a deep breath, a big sip, and relax.